What better way to honor Tom Brady for being the greatest of all time than with his own themed beer. Just in time for Super Bowl LIII, Boston-based Sam Adams is releasing a special GOAT-themed beer in honor of New England Patriots quarterback Tom Brady. 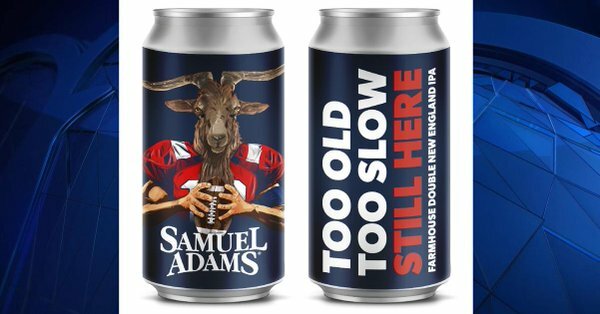 “Too Old, Too Slow, Still Here,” a 7.8 percent ABV double New England IPA “commemorating the greatest team of all time and the GOAT itself,” will be sold in crowlers and on draft in the Sam Adams Boston Brewery in Jamaica Plain on Thursday from 4:30 to 7:30 p.m. or until the kegs are kicked. Anyone who isn’t one of the first 199 to show up will still be able to purchase the Brady beer on draft in the taproom until it’s gone.